A friend of mine got to read Blood Marriage by Regina Richards before it was printed, and she said it is so beautifully written it even made her like vampires and she doesn't like vampire books. So as soon as I heard this was out, I immediately went and bought my copy. I'm excited to have Regina as a guest today. So Regina, tell us a little about what Blood Marriage is about. 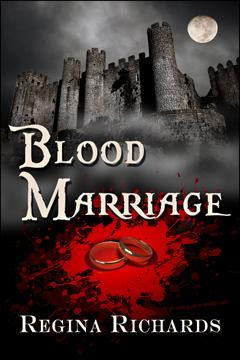 Set in England in 1813, Blood Marriage is the story of Elizabeth Smith, a young woman who is dying of the same mysterious disease that has claimed most of her family. One night she meets Nicholas Devlin, a charming man who lures her into a rose garden with disastrous results. In short order she finds herself married to Nicholas and at turns frightened and confused by his behavior and the behavior of nearly everyone around him: his family, his friends, and even his houseguests. When a pair of detectives arrive at Elizabeth’s new home to accuse Nicholas of a series of vampire-style killings, Elizabeth is certain they have the wrong man. Yet as servants, friends, and even family die, she begins to question who - or what - she’s married. Is she falling in love with a monster? As the evidence mounts against Nicholas and the detectives close in on their killer, Elizabeth must decide whether to follow her head or her heart. A few days later I had an amazingly vivid dream about vampires. I won’t go into detail, though I remember the dream clearly still, but it spurred me on to write this story. I blog most Mondays at reginarichards.net and would love to have everyone drop by and add their two cents to whatever I’m musing about that day. Also, I’m currently working on a new series of three connected romantic alternative history novels. What if the plague that decimated Europe in the Middle Ages had come with a twist that produced a very different society? Look for the first of this series in the winter of 2013. Finally, if there’s sufficient interest in Blood Marriage, I have a second novel in mind along similar lines and would love to write it. So if readers like Blood Marriage and want to see more Regency Gothic Vampire Romance, they can contact me through my website and let me know. Thanks for inviting me to your absolutely gorgeous blog today, Clover. Hi, Clover and Hello, Regina! I've purchased your book and I can't wait to read it. If anyone can make me like Vampire's, it's you! Proud to say I was the first to like and buy your book, Regina. Can't wait to have an hour or two to read it. And I agree with Molly... If ANYONE can make me like vampires...it's yo. (I've had sneak peeks at Blood Marriage...been waiting quite a while for its release. Hey, Clover. Regina, I'm so tickled your book is out. Is it only thorugh Amazon? I wish Amazon and B & N would stop fighting. I love reading on my Nook. You must be a real pantser to go from the coffin on the porch to this book. I went through several years of reading vampire hunter type books. I'll definitely give this a try. Good luck on sales. Hi Regina (also waving at Clover)! I already bought your book and can't wait to dig in. I have a feeling you're going to keep me up at night reading if I start on it today! Congrats on your book birthday!! It's so good. I'm already on chapter 4 and I have had zero time to read today. Regina!! Sorry I'm late to the party. I'm so excited your book is out and I can't wait to read it. Hi Marty! Thanks for buying a copy. :) I love your writing sooo much. I'm thrilled to have a talent like you give my vampires a whirl. Thanks, Angie! You've been such a pillar of positive energy and support all these years. I really appreciate it! Sorry I didn't respond yesterday. Having these kids home from college exhaustin-, er, I mean, WONDERFUL! Love 'em dearly. But just between you and me, while I was so glad to have them home, I suspect sending them back to school in January will be a little easier than I thought it would be when they first arrived back home in mid-December. Looking forward to seeing you at the January meeting. Thanks, Barb! Thanks Clover!Thanks Jerrie! You three rock! The only information gathered here is your email IF and only if you sign up to receive my wonderfully awesome newsletter. Other than that, this is a safe and friendly site that will not store or sell or giveaway (because we don't store it anyway) your information.